"What’s heaven? Heaven is where the police are British, the chefs are French, the mechanics are German, the lovers are Italian and the bankers are Swiss. This page Italy is part of the Ancient Rome series. A country in southern Europe, one of the states of the European Union. Official name: The Italian Republic (in Italian, la Repubblica Italiana). Italy did not exist as a state until the country's unification in 1861. Due to this comparatively late unification, and the historical autonomy of the regions that comprise the Italian Peninsula, many traditions and customs that are now recognized as distinctly Italian can be identified by their regions of origin. Despite the political and social distinction of these regions, Italy's contributions to the cultural and historical heritage of Europe and the world remain immense. Italy is home to the greatest number of UNESCO World Heritage Sites (44) to date, and has rich collections of world art, culture and literature from many different periods. Italy has had a broad cultural influence worldwide, also due to the fact that numerous Italians emigrated to other countries during the Italian diaspora. Italy has, overall, an estimated 100,000 monuments of any sort (museums, palaces, buildings, statues, churches, art galleries, villas, fountains, historic houses and archaeological remains). Italy boasts a long period of different architectural styles, from Classical Roman and Greek, Gothic, Renaissance, Baroque, Neo-Classical, Art Nouveau to Modern. The nation contains several architectural monuments, such as the Pantheon, the Colosseum, the Leaning Tower of Pisa, the Piazza del Campo, Milan Cathedral, Florence Cathedral, the Palladian Villas of the Veneto, the Basilica di Santa Maria Maggiore, Villa Olmo and the Pirelli Tower. Italy has also been home to numerous famous architects, some who even changed the course of architectural history, such as Andrea Palladio (who founded Palladianism), Filippo Brunelleschi, Bernini and Renzo Piano. Italian architecture began with Ancient Greece, Ancient Rome and Etruscans, when both civilizations built temples, basilicae, columns, fora, palaces, aqueducts, walls and public baths. Roman architecture had great influence on that of Italy and the Western world. 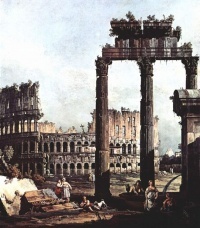 Because the Roman Empire extended over so great an area and included so many urbanised areas, Roman engineers developed methods for civic development on a grand scale, including the use of concrete. Massive buildings like the Pantheon and the Colosseum could never have been constructed with pre-existing techniques. Though concrete had been invented a thousand years earlier in the Near East, the Romans extended its use from fortifications to their most impressive buildings and monuments, capitalising on the material’s strength and low cost. In Roman architecture, a wall's concrete core was covered with a plaster, brick, stone, or marble veneer, and decorative polychrome and gold-gilded sculpture was often added to produce a dazzling effect of power and wealth. Gothic architecture appeared in Italy in the 12th century, but did not mature into a regionally distinct style until the 13th century, partly due to geographic factors. Due to its comparatively late maturity, the influence of Byzantine and classical art, and the fact that brick —not stone— was the most common building material and marble the most common decorative material, Italian Gothic architecture maintained peculiar characteristics which differentiated its evolution from that in France, where it had originated, and in other European countries. In particular, the architecturally daring solutions and technical innovations of the French Gothic cathedrals rarely appeared. With the exception of the Cathedral of Milan, the product of a centuries-long collaboration between Italian, French, and German minds, few Italian churches show the emphasis on vertical development, clustered shafts, ornate tracery and complex ribbed vaulting that characterise Gothic in other parts of Europe. Notable examples of Italian Gothic architecture include Basilica of Santa Croce, Orvieto Cathedral, and Siena Cathedral, where the distinctively ornate Italian realization of façade design is evident. Italian architects had always preferred forms that were clearly defined and structural members that expressed their purpose. Many Tuscan Romanesque buildings demonstrate these characteristics, as seen in the Florence Bapistry and Pisa Cathedral. Italy then became a main European centre for the baroque, with diverse baroque architectural styles emerging, especially in Sicily (see Sicilian baroque). In the 18th and 19th centuries neo-classical style buildings began to appear in Rome, Milan, Turin and all around Italy. The 19th century also saw the construction of several considerable works of Italian architecture, including the Galleria Vittorio Emanuele II in Milan, one of the world's oldest shopping galleries, which influenced others such as the Galleria Umberto I in Naples, the Burlington Arcade in London and the Passazh in Saint Petersburg. In the 20th century, Italy too saw the construction of several significant edifices, starting in the Art Nouveau architectural style, which in Italy was called, Liberty architecture. Rationalist-Fascist architecture developed in Italy during the Fascist era, lasting until the 1940s. During that period Italy built the world's first motorway between Milan and Varese in 1921, and considerable architectural works of the era include Fiat's Lingotto, at the time the world's biggest automobile factory. In the 1950s and 60s several skyscrapers were built across the country, the Pirelli Tower and the Torre Velasca being the most notable. The 21st century most notable Italian buildings are at the FieraMilano exposition centre in Rho, just outside Milan, (one of Europe's biggest and most important exhibition centres) and the new plans for the Expo 2015 to be held in Milan too, where three new skyscapers called "lo storto", "il curvo" and "il diritto" will be constructed by foreign architects such as Zaha Hadid, Arata Isozaki and Daniel Libeskind. This will also be a project or urban re-development, called "City-Life", where new pedestrian areas, parks, green spaces, lakes and waterways will be constructed, in the North-Western part of Milan. Italy boasts a wide variety of palaces, in various cities, mainly Rome, Florence, Venice, Milan, Turin, Bologna and Naples, built in a wide variety of different styles, from Roman, Byzantine, Romanesque, Medieval and Gothic, to Renaissance, Baroque, Rococo, Neo-Classical and Fascism. In Italian, the word "Palazzo" is more broadly used in Italy than its English equivalent “palace”. In Italy, a palazzo is a grand building of some architectural ambition that is the headquarters of a family of some renown or of an institution, or even what the British would call a “block of flats” or a tenement. In Venice, most palaces are referred to as "Ca'", which is short for "Casa", meaning "house" in Italian, for example Ca' Pesaro or Ca' Rezzonico. Examples of major and famous Italian palaces include Palazzo Spada, Palazzo Laterano, Palazzo Quirinale, Palazzo Vecchio, Palazzo Pitti, Palace of Caserta, Royal Palace of Turin, Royal Palace of Capodimonte, Royal Palace (Naples), Palazzina di caccia of Stupinigi, Palazzo Litta, Palazzo del Te, Ca' d'Oro, Ca' Foscari, Doge's Palace and Ca' Rezzonico, to name a few. Italy has several villas with notable formal gardens, most of which designed as Italian gardens, such as those of Villa d'Este. Their principles are of perfect geometry and symmetry and of imposing order over nature. Italian gardens were influenced by Roman gardening and Italian Renaissance gardening, and have been copied by other courts around Europe over the centuries. The Italian Renaissance garden emerged in the late fifteenth century at villas in Rome and Florence. Inspired by classical ideals of order and beauty, they were intended to provide a pleasurable view of the garden and the landscape beyond it, for contemplation, and for enjoyment of the sights, sounds and smells of the garden itself. In the late Renaissance, the gardens became larger, grander and more symmetrical, and were filled with fountains, statues, grottoes, water organs and other features designed to delight their owners and amuse and impress visitors. The style was imitated throughout Europe, influencing the gardens of the French Renaissance and the English garden. Over the centuries, Italian art has gone through many stylistic changes. Italian painting is traditionally characterized by a warmth of colour and light, as exemplified in the works of Caravaggio and Titian, and a preoccupation with religious figures and motifs. Italian painting enjoyed preeminence in Europe for hundreds of years, from the Romanesque and Gothic periods, and through the Renaissance and Baroque periods, the latter two of which saw fruition in Italy. Notable artists who fall within these periods include Michelangelo, Leonardo da Vinci, Donatello, Botticelli, Fra Angelico, Tintoretto, Caravaggio, Bernini, Titian and Raphael. Thereafter, Italy was to experience a continual subjection to foreign powers which caused a shift of focus to political matters, leading to its decline as the artistic authority in Europe. Not until 20th century Futurism, primarily through the works of Umberto Boccioni and Giacomo Balla, would Italy recapture any of its former prestige as a seminal place of artistic evolution. Futurism was succeeded by the metaphysical paintings of Giorgio de Chirico, who exerted a strong influence on the Surrealists and generations of artists to follow. The basis of the modern Italian language was established by the Florentine poet Dante Alighieri, whose greatest work, the Divine Comedy, is considered amongst the foremost literary statements produced in Europe during the Middle Ages. There is no shortage of celebrated literary figures in Italy: Giovanni Boccaccio, Giacomo Leopardi, Alessandro Manzoni, Torquato Tasso, Ludovico Ariosto, and Petrarch, whose best-known vehicle of expression, the sonnet, was invented in Italy. Prominent philosophers include Giordano Bruno, Marsilio Ficino, Niccolò Machiavelli, and Giambattista Vico. Modern literary figures and Nobel laureates are nationalist poet Giosuè Carducci in 1906, realist writer Grazia Deledda in 1926, modern theatre author Luigi Pirandello in 1936, poets Salvatore Quasimodo in 1959 and Eugenio Montale in 1975, satirist and theatre author Dario Fo in 1997. Italian theatre can be traced back to the Roman tradition which was heavily influenced by the Greek; as with many other literary genres, Roman dramatists tended to adapt and translate from the Greek. For example, Seneca's Phaedra was based on that of Euripides, and many of the comedies of Plautus were direct translations of works by Menander. During the 16th century and on into the 18th century, Commedia dell'arte was a form of improvisational theatre, and it is still performed today. Travelling troupes of players would set up an outdoor stage and provide amusement in the form of juggling, acrobatics, and, more typically, humorous plays based on a repertoire of established characters with a rough storyline, called canovaccio. From folk music to classical, music has always played an important role in Italian culture. Instruments associated with classical music, including the piano and violin, were invented in Italy, and many of the prevailing classical music forms, such as the symphony, concerto, and sonata, can trace their roots back to innovations of sixteenth- and seventeenth-century Italian music. Italy's most famous composers include the Renaissance composers Palestrina and Monteverdi, the Baroque composers Alessandro Scarlatti, Corelli and Vivaldi, the Classical composers Paganini and Rossini, and the Romantic composers Verdi and Puccini. Modern Italian composers such as Berio and Nono proved significant in the development of experimental and electronic music. While the classical music tradition still holds strong in Italy, as evidenced by the fame of its innumerable opera houses, such as La Scala of Milan and San Carlo of Naples, and performers such as the pianist Maurizio Pollini and the late tenor Luciano Pavarotti, Italians have been no less appreciative of their thriving contemporary music scene. Italy is widely known for being the birthplace of opera. Italian opera was believed to have been founded in the early 1600s, in Italian cities such as Mantua and Venice. Later, works and pieces composed by native Italian composers of the 19th and early 20th centuries, such as Rossini, Bellini, Donizetti, Verdi and Puccini, are amongst the most famous operas ever written and today are performed in opera houses across the world. La Scala operahouse in Milan is also renowned as one of the best in the world. Famous Italian opera singers include Enrico Caruso, Alessandro Bonci, the late Luciano Pavarotti, and Andrea Bocelli, to name a few. Introduced in the early 1920s, jazz took a particularly strong foothold in Italy, and remained popular despite the xenophobic cultural policies of the Fascist regime. Today, the most notable centers of jazz music in Italy include Milan, Rome, and Sicily. Later, Italy was at the forefront of the progressive rock movement of the 1970s, with bands like PFM and Goblin. Today, Italian pop music is represented annually with the Sanremo Music Festival, which served as inspiration for the Eurovision song contest, and the Festival of Two Worlds in Spoleto. Singers such as pop diva Mina, classical crossover artist Andrea Bocelli, Grammy winner Laura Pausini, and European chart-topper Eros Ramazzotti have attained international acclaim. The history of Italian cinema began a few months after the Lumière brothers began motion picture exhibitions. The first Italian film was a few seconds long, showing Pope Leo XIII giving a blessing to the camera. The Italian film industry was born between 1903 and 1908 with three companies: the Società Italiana Cines, the Ambrosio Film and the Itala Film. Other companies soon followed in Milan and in Naples. In a short time these first companies reached a fair producing quality, and films were soon sold outside Italy. Cinema was later used by Benito Mussolini, who founded Rome's renowned Cinecittà studio for the production of Fascist propaganda until the World War II. After the war, Italian film was widely recognised and exported until an artistic decline around the 1980s. Notable Italian film directors from this period include Vittorio De Sica, Federico Fellini, Sergio Leone, Pier Paolo Pasolini, Michelangelo Antonioni and Dario Argento. Movies include world cinema treasures such as La dolce vita, Il buono, il brutto, il cattivo and Ladri di biciclette. In recent years, the Italian scene has received only occasional international attention, with movies like La vita è bella directed by Roberto Benigni and Il postino with Massimo Troisi. Through the centuries, Italy has given birth to some notable scientific minds. Amongst them, and perhaps the most famous polymath in history, Leonardo da Vinci made several contributions to a variety of fields including art, biology, and technology. Galileo Galilei was a physicist, mathematician, and astronomer who played a major role in the Scientific Revolution. His achievements include improvements to the telescope and consequent astronomical observations, and support for Copernicanism. The physicist Enrico Fermi, a Nobel prize laureate, was the leader of the team that built the first nuclear reactor and is also noted for his many other contributions to physics, including the co-development of the quantum theory. A brief overview of some other notable figures includes the astronomer Giovanni Domenico Cassini, who made many important discoveries about the Solar System; the physicist Alessandro Volta, inventor of the electric battery; the mathematicians Lagrange, Fibonacci, and Gerolamo Cardano, whose Ars Magna is generally recognized as the first modern treatment on mathematics, made fundamental advances to the field; Marcello Malpighi, a doctor and founder of microscopic anatomy; the biologist Lazzaro Spallanzani, who conducted important research in bodily functions, animal reproduction, and cellular theory; the physician, pathologist, scientist, and Nobel laureate Camillo Golgi, whose many achievements include the discovery of the Golgi complex, and his role in paving the way to the acceptance of the Neuron doctrine; and Guglielmo Marconi, who received the Nobel Prize in Physics for the invention of radio. Italian fashion has a a long tradition, and is regarded as one of the most important in the world, along with French fashion, American fashion, British fashion and Japanese fashion. Milan, Florence and Rome are Italy's main fashion capitals, however Naples, Turin, Venice, Bologna, Genoa and Vicenza are other major centres. According to the 2009 Global Language Monitor, Milan was nominated the true fashion capital of the world, even surpassing other international cities, such as New York, Paris, London and Tokyo, and Rome came 4th. Major Italian fashion labels, such as Gucci, Prada, Versace, Valentino, Armani, Dolce & Gabbana, Missoni, Fendi, Moschino, Max Mara and Ferragamo, to name a few, are regarded as amongst the finest fashion houses in the world. Also, the fashion magazine Vogue Italia, is considered the most important and prestigious fashion magazine in the world. Modern Italian cuisine has evolved through centuries of social and political changes, with its roots reaching back to the 4th century BC. Significant change occurred with the discovery of the New World, when vegetables such as potatoes, tomatoes, bell peppers, and maize became available. However, these central ingredients of modern Italian cuisine were not introduced in scale before the 18th century. Ingredients and dishes vary by region. However, many dishes that were once regional have proliferated in different variations across the country. Cheese and wine are major parts of the cuisine, playing different roles both regionally and nationally with their many variations and Denominazione di origine controllata (regulated appellation) laws. Coffee, and more specifically espresso, has become highly important to the cultural cuisine of Italy. Some famous dishes and items include pasta, pizza, lasagna, focaccia, and gelato. Unless indicated otherwise, the text in this article is either based on Wikipedia article "Italy" or another language Wikipedia page thereof used under the terms of the GNU Free Documentation License; or on original research by Jahsonic and friends. See Art and Popular Culture's copyright notice. This page was last modified 15:32, 28 February 2019. This page has been accessed 18,695 times.